After Saul heard this message from Samuel, he sent messengers for the men to join his army troop at Telaim. Then Saul led the army troop to a valley near a town of the Amalekites. Some Kenites lived nearby. Saul doesn’t want to kill them so he asked them to leave the place. The Kenites left and evacuated the place. Then Saul and his army attacked the Amalekites. They kill every men, women and babies of the Amalekites and captured King Agag. 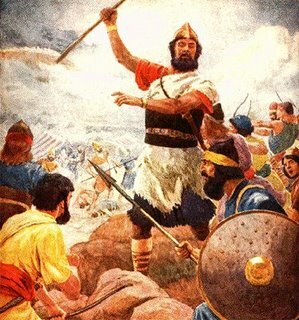 Saul did not obeyed the Lord because he didn’t kill King Agag and held back some of the Amalekites’ livestock. Saul held on to the edge of Samuel’s garment and it tore. Samuel agreed to go back with Saul and he went with Saul to worship the Lord. King Agag thought, “They surely won’t kill me!” But Samuel took a sword and chopped King Agag into pieces. After that, Samuel went back home to Ramah; and Saul returned to Gibeah. Although Samuel felt depressed about Saul, he never sees him again.